Bayanda Mthetho, 15-year old Graeme College learner, is a member of the Makana Choir School. He began piano lessons at the age of 11, and has recently passed the Grade 8 Trinity piano exam, with the astonishing mark of 97%! At the age of 13, he started organ lessons with Dr A-J Bethke, but since Dr Bethke’s departure from Grahamstown in April 2017, the lessons came to an end. 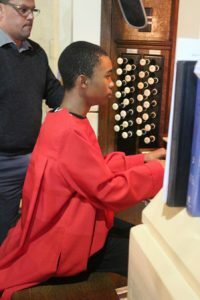 Bayanda has increasingly been used as a rehearsal pianist for the Cathedral Choir. In the National Arts Festival of 2017 he made his debut accompanying the choir on the piano for the programme ‘Under African Skies’ compiled by Ron Gill. More recently he has been the regular accompanist for the Choir when they sing anthems during services, either on the piano or the organ. During the second half of 2018 he has sometimes accompanied entire services of Choral Evensong. For a video of Bayanda playing part of Bach’s Prelude No 5 in G Major, BWV 557, click here. In order that Bayanda could continue to receive organ lessons, at the end of 2017 the Makana Choir School launched an appeal for sponsorship. A generous donor with Grahamstown connections, now living overseas, responded with a gift of six months’ organ lessons. And to add to the joy, the family of the donor offered to match the sum, so Bayanda’s organ lessons are covered for the whole of 2018! Read a message from the family here. Our heartfelt thanks to these generous donors, and to a further donor who sent an additional sum. As a result of the generosity of these sponsors, throughout 2018 Bayanda received organ lessons from Jovan Heynsen, music teacher and Choir Director of St Andrew’s College and DSG Choirs. As there is still no Organist and Director of Music at the Cathedral, it is intended that Mr Heynsen will continue to teach Bayanda the organ in 2019. Bank: First National, Grahamstown (Makhanda). Donors are requested to put as reference “Bayanda Organ” and their surname. Requests for anonymity will be respected. It is envisaged that Bayanda will receive one organ lesson per week throughout school terms, @ R350 per lesson. Mr Heynsen also intends that he take an organ exam during the course of the year. He is an incredibly talented and extraordinarily gifted musician! – Revd Canon Dr Claire Nye Hunter. Bayanda is a gifted and hard-working young man, who I am convinced has the potential to be a top musician. His determination and consistency are to be lauded. – Dr Andrew-John Bethke.